This passionfruit pudding is very easy to whip up, making it perfect for a lazy weeknight on the couch. 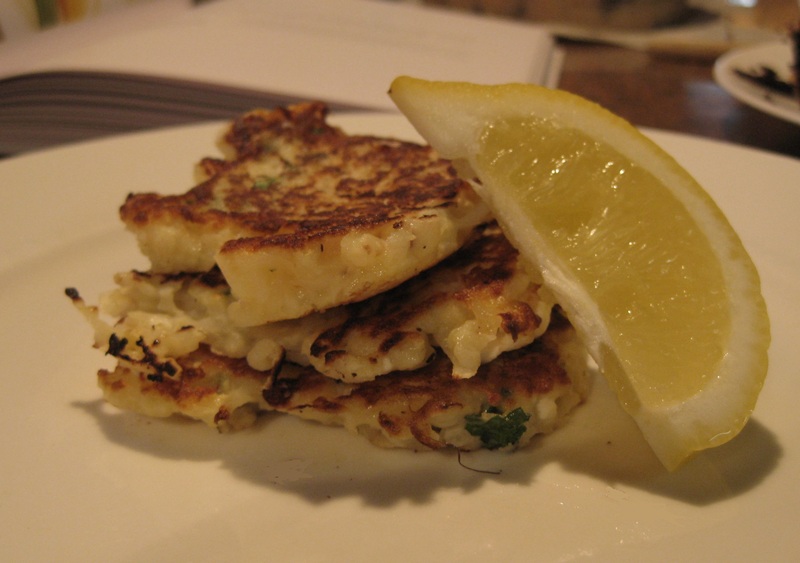 The recipe comes from bills food by the lovely Bill Granger and it was perfect for the current weather. It’s just about to hit summer in Melbourne so I’m craving the taste of fresh tropical fruits, but the weather is still chilly enough to need a comforting pudding and I am never one to resist a warm dessert. Preheat the oven to 170C and grease 4 ramekins. Beat the butter and sugar until well combined. 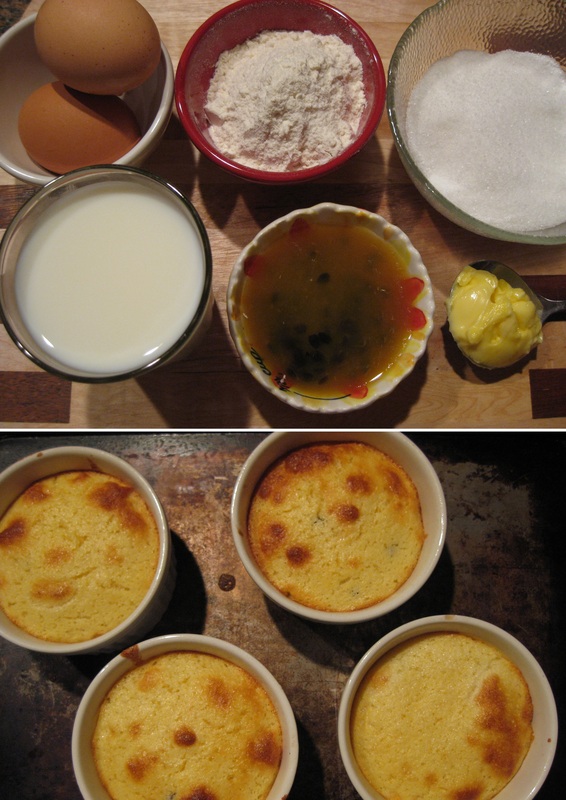 Mix in the flour, milk, passionfruit and egg yolks. Fold the egg whites into the mixture and then pour into ramekins. Bake for 15 minutes, or until the top is golden. Serve with extra passionfruit for a really strong taste. That’s right, more Bill Granger loving. Perhaps bordering on an obsession but it’s difficult when the guy creates such amazing sounding food (including homemade english muffins and pasta, spinach and sausage bake). 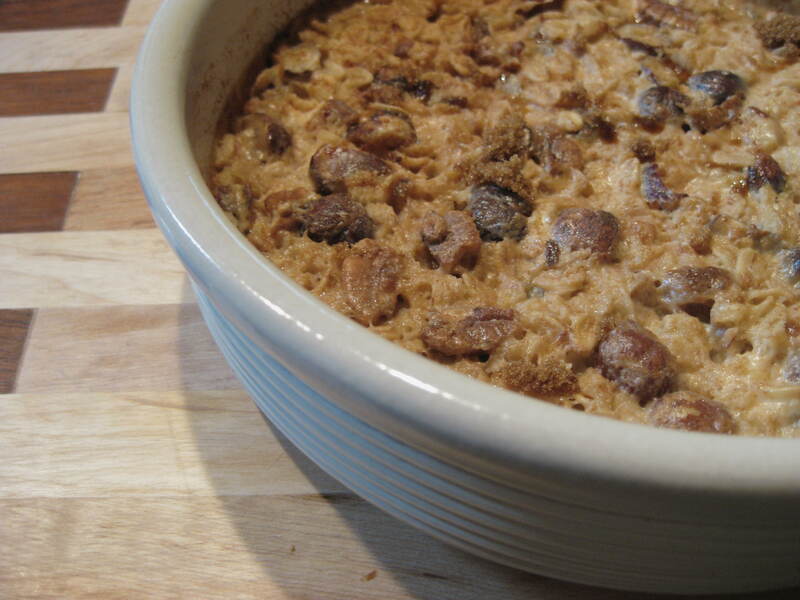 The recipe for baked porridge caught my because I have never tried it before – I love stove top porridge but had never even thought of baking it in the oven. Bill says he was “inspired by the old-fashioned aristocratic tradition of baking porridge in the Aga overnight” and that this is the urban version without “the country house, the Aga or the butler”. The fact that this recipe is both simple and needs a while in the oven means it is perfectly designed to stumble out of bed, quickly prepare and put in the oven while bleary eyed, and creep back into bed while it bakes. The baked porridge has a completely different texture and taste to stove top porridge and is definitely worth a repeat make! Preheat the oven to 130C (fan forced). Mix all the ingredients together in a baking dish. Place in the oven for about 45 minutes. Enjoy. I’m pretty sure it can’t get any easier than that – no mixing bowls or special method of adding the ingredients whatsoever. Bill Granger’s new cookbook Bill’s Basics really is fantastic. Seriously, if you havent got yourself a copy of it, try winning it here. I made the english muffins a little while ago, but I’ve been drooling over the baked pasta dish since the crew at A Cookbook A Month cooked it a month ago, and after making it myself, I can tell you that it really is a drool worthy recipe! 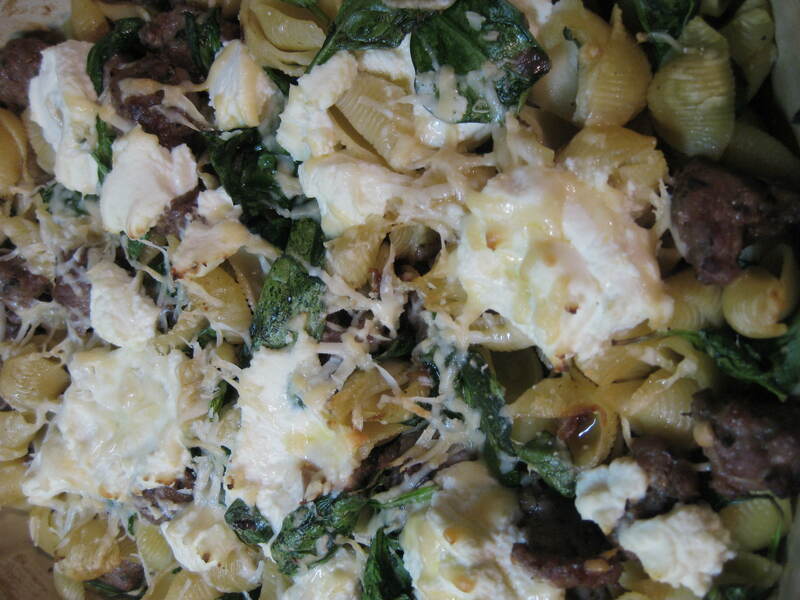 I changed the recipe around a little based on what I had at hand – I substituted baby spinach for cavolo nero and conchiglie for orecchiette – but everything still worked perfectly and I doubt it altered the taste dramatically. This was really delicious and simple with every bite tasting slightly different – no chance of being bored, instead you will be upset when it is finished! Preheat the oven to 160C (fan-forced). Cook the pasta in boiling water until al dente, drain, and tip into a baking dish. Mix the spinach leaves in to wilt them slightly. Place a frying pan over medium heat and heat the oil. Add the garlic and onion with a pinch of sea salt. After 2-3 minutes, add the chilli flakes, fennel seeds and sausage, and cook while stirring until the sausage has browned (about 5 minutes). Add the sausage mixture to the pasta and spinach and stir together. Spread the ricotta and parmesan over the top and bake for 10-15 minutes (don’t take it out until the cheese has melted). I bought a copy of Bill Granger’s new book Bill’s Basics a couple of weeks ago. It is full to the brim of Bill’s 100 favourite recipes covering everything from chocolate chip cookies and baked lemon cheesecake to thai beef salad and french onion soup. As Bill is such a breakfast champion I decided to make something from the breakfast section first. There were so many great sounding choices but I was intrigued by the recipe for homemade english muffins – and that’s what I woke up bright and early this morning to make! Combine the yeast, baking soda, water and half the flour. Leave for at least five minutes. In the meantime beat the eggs until they form stiff peaks. Fold the eggs into the dough. Slowly add the salt and the remaining flour into the mixing bowl. When the dough thickens, tip out onto your bench and start kneading. Knead until the dough becomes smooth, this will take about ten minutes. Put the dough back into the bowl and cover with cling wrap. Leave it in a warmish area until it doubles in size, this will take about an hour. Roll the dough out to a thickness of about 2 cm and leave to rest for a couple of minutes. Dust the surface of a baking tray with some of the polenta. Use a circular pastry cutter (I used a 6 cm cutter to make mini muffins but feel free to use a bigger one) to cut out pastry circles. Re-roll any remaining dough to make extra muffins. Place them on the tray and dust with some extra polenta. Cover with cling wrap and leave for 45 minutes for the dough to continue proving. Put a large frypan over medium heat and drizzle with a little oil. Cook the muffins in batches, they will only take a couple of minutes each side. Allow to cool slightly on a wire rack before eating. It will be really easy to pull the muffins apart with your fingers, but if you can’t use a fork. It’s better than using a knife as you don’t destroy all the little chewy nooks and crannies! While cooking the muffins I quickly whipped up some scrambled eggs on S’s request. So delicious, and totally worth waiting for all the muffins to rise! Bills is owned by the loveable home taught cook Bill Granger and yes, it kills me that the name of his store is missing an apostrophe. Bill is famous around the world for his breakfasts and his ability to create simple meals that taste great. I’ve made a few of his recipes before and they were a huge success, so we thought we would head to one of his restaurants to see what it was like. The store has a sleek industrial look – there is light bouncing off the white surfaces, metal accents, and just enough wood to warm the look up. We sat nestled in the corner drinking café lattes while perusing the menu. I always find it difficult to resist the idea of dessert for breakfast so I chose ricotta hotcakes (do they always call pancakes this in Sydney?) 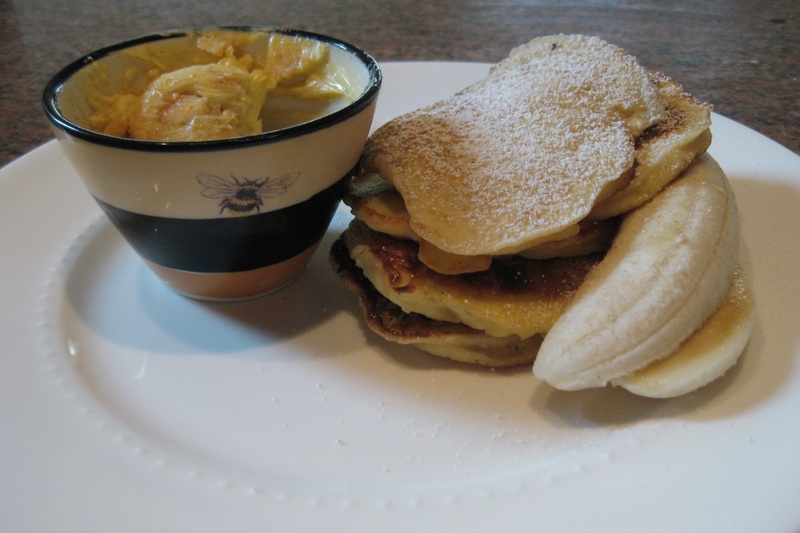 with banana, maple syrup and honeycomb butter. The pancakes were light and fluffy, and the ricotta provided just enough of a tart taste to offset the fact that I was drenching them in syrup. S chose the corn fritters with avocado salsa, spinach, roast tomato and bacon. I stole some of his breakfast which was also really yummy, however, I’ve made the fritters and salsa from one of Bill’s books before and we both decided that my version was even better than the restaurant version – yay! I first heard of this bakery when I saw its book in store (my mum owns the book and although we have never made anything from it, I do look longingly at the bread, tarts and muffins within on occasion) and I had decided it was a must visit. The bakery had rustic looking bread on old wooden shelves and a steady crowd of regulars walking through the door for the favourite treat. You could tell how dedicated this crowd was – all the outdoor seats were full, even though it was a struggle to hear anything with a jackhammer tearing the road up only a couple of metres away. We chose a few items to take away and eat in a quieter street – they were definitely worth the wait. We munched our way through a pear and rhubarb muffin (it was almost as light as a cupcake), a tart filled with fresh raspberries and silky chocolate mousse and a golden ginger brulee tart with jewel like pistachios scattered on the top. I loved the ginger tart and I think it would have worked perfectly with a big cup of chai latte. 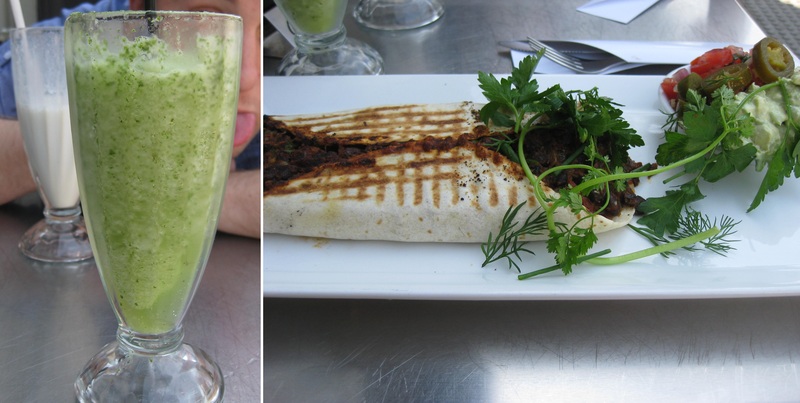 Burritos and a mojito for brunch? I know it sounds a bit odd, but it was late morning, the sun was beating down and the mojito didn’t actually have any alcohol in it. We stumbled across a little café and we were really glad to grab a seat in the warm shade outdoors. S had a fairly traditional breakfast – poached eggs and baked beans on toast with a banana smoothie – but I loved the idea of having something typically unbreakfasty. I ordered a vegetarian breakfast burrito, which was filled with black beans and cheese and came with diced tomato, red onion, guacamole and jalapenos to sprinkle all over the top. I washed it all down with a huge glass of lime, mint and sweet icy water. My breakfast filled me right up and made me feel really fresh and zingy! I was expecting a giant queue out the door so I was pleasantly surprised to see that the queue was contained within the store. The window display was full of standard (and not so standard) viennoiserie, but the counters within the store were heaving with brightly coloured and oddly shaped tarts, cakes and macarons. As the queue creeped through the store I decided on my order -and was shocked when a woman actually pushed in front of me and ordered when it was obvious I was before her. Luckily I had a huge box of sugar to make me feel better! S and I wandered down to the local park to get started on our box of goodies but it took us a whole day of sugar highs and lows to work our way through it. The cakes and tarts were definitely the highlight but we also bought a pepito (a pastry filled with chocolate and cinnamon) and two macarons (passionfruit yoghurt and rice pudding) which were scrumptious! The most creative cake was the cherry can of cola (“Escape from a Colombia Rainforest”) – a chocolate mousse covered with tangy cherry dust. When we opened the chocolate “ringpull” we discovered it was filled with a gooey cherry cola jam. ‘Ed Rocks the Cradle’ was another crazy dessert that somehow didn’t collapse (I have no idea how!). It was a chocolate biscuit base filled with a chocolate/coffee mousse and topped with caramel and Italian meringue. ‘Charlie Brown’ looked a bit plainer but was the best tasting dessert – a tart base filled with layers of caramelised nuts and chocolate mousse, it was topped with a thin sheet of peanut brittle. I adore peanuts and chocolates together and the caramelised sugar managed to further improve it. After eating so much food we were definitely glad we walked around the city instead of catching a bus or train!